Fajita night just got WAY easier. I’ll admit, I have very basic, rudimentary knife skills. I definitely don’t hold the knife the right way and I could certainly mince with more precision. I will say, I’m sure a knife skills 101 class would make me a quicker cook, since buying a great brand of knives in the first place changed my cooking game. I’m not great at getting evenly sliced cuts when I slice vegetables, especially when slicing onions and peppers. Some are chunky, some are crooked, and some are too thin. Luckily, enter my savior, the Inspiralizer. The Inspiralizer makes gorgeous noodles out of veggies, but it also works just like a veggie slicer and is much easier to use than a mandoline. Whenever I do spiralizing demos, people always give me the most “oohs” and “aahs” when I spiralize onions and bell peppers! I think it’s because we all secretly hate slicing onions and peppers. It’s monotonous and takes a lot of focus! Well, you’ll be able to spiralize an onion in under 10 seconds (more like 5 seconds) with the Inspiralizer. All the same width and shape. Easy to toss into meals like these chicken fajitas! I added sweet potato noodles for some extra heartiness and nutrients. 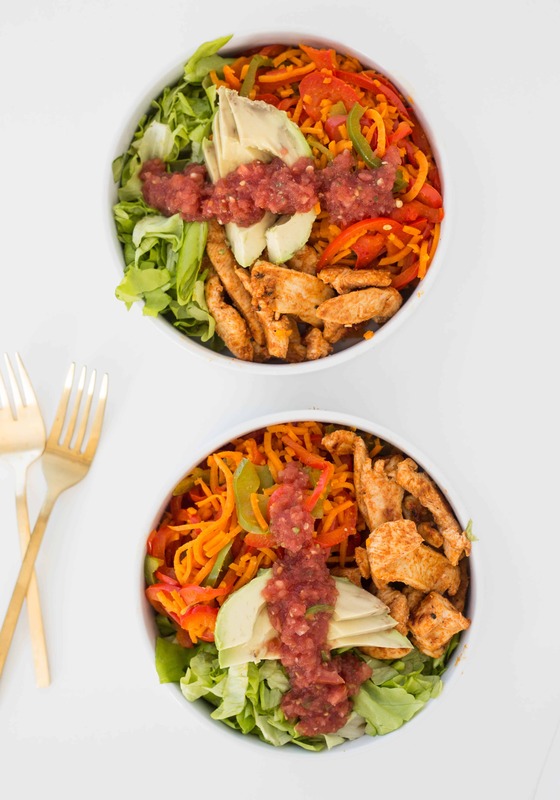 Plus, I love roasted and cubed sweet potatoes in my burrito bowls, so I wanted to incorporate them here! They add a nice sweetness. Make these fajitas for dinner and then bring the leftovers to work the next day – they save well in the refrigerator! And you can’t go wrong with avocado, salsa, and fajitas, right? Happy Monday! Hope you all are having a stellar start to your weeks! 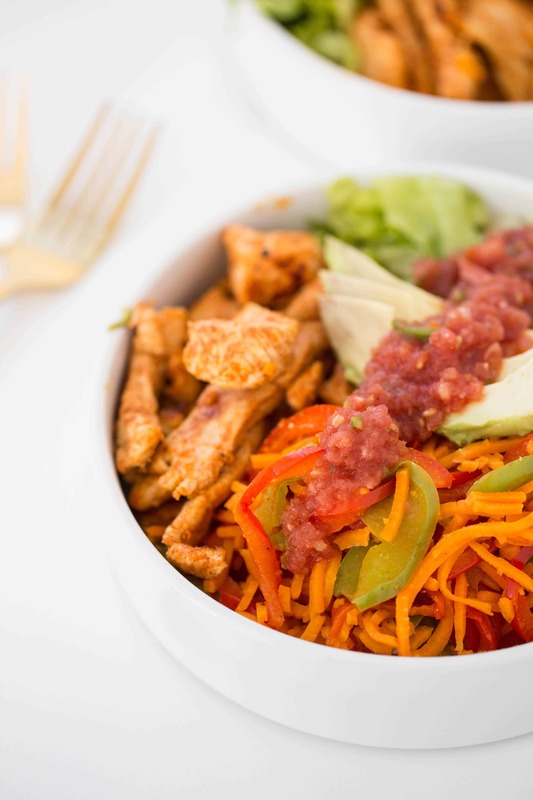 Mix together the ingredients for the fajita seasoning a small bowl. Place the chicken, half the olive oil, lime juice, and half of the fajita seasoning in a medium bowl and toss together well. Set aside in the refrigerator while you prepare the spiralized vegetables. Spiralize the bell peppers and onions with Blade A. Switch to Blade D and spiralize the sweet potatoes. Heat a large skillet over medium-high heat. Once heated, add the chicken and any remaining oil/seasonings. Cook for 5 minutes per side or until chicken is cooked through and no longer pink on the inside. Set aside. Heat the remaining olive oil in the skillet back over medium-high heat. Immediately add the sweet potatoes, onions, and bell peppers. Add the remaining fajita seasoning mix and toss well to combine. Let cook for 10 minutes or until potatoes are cooked through, tossing occasionally. 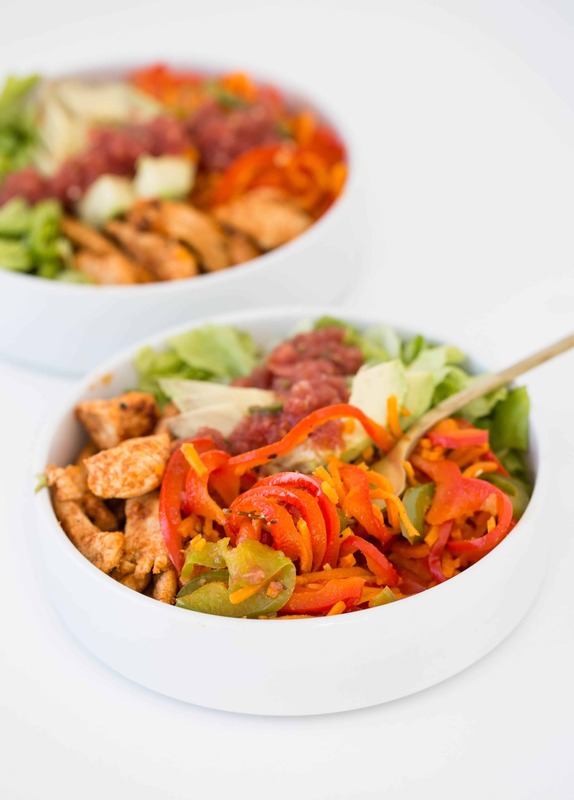 Assemble the fajita bowls: divide the fajita mixture, chicken, and lettuce into bowls. Top with avocado and salsa. Ali, when you are calculating WW points are you calculating on a per serving? For instance when you say its 8 points, is that per serving or for the whole recipe? I love your recipes, thanks for sharing. now I see them. Sorry I missed them the first time through. This was great and surprisingly filling. Even my husband said, "It's good!" High praise since his usual answer is "fine."